Why Mumps And Measles Can Spread Even When We're Vaccinated : Shots - Health News A mumps outbreak in Ohio has ballooned to 234 cases, even though the community is well-protected against the virus. 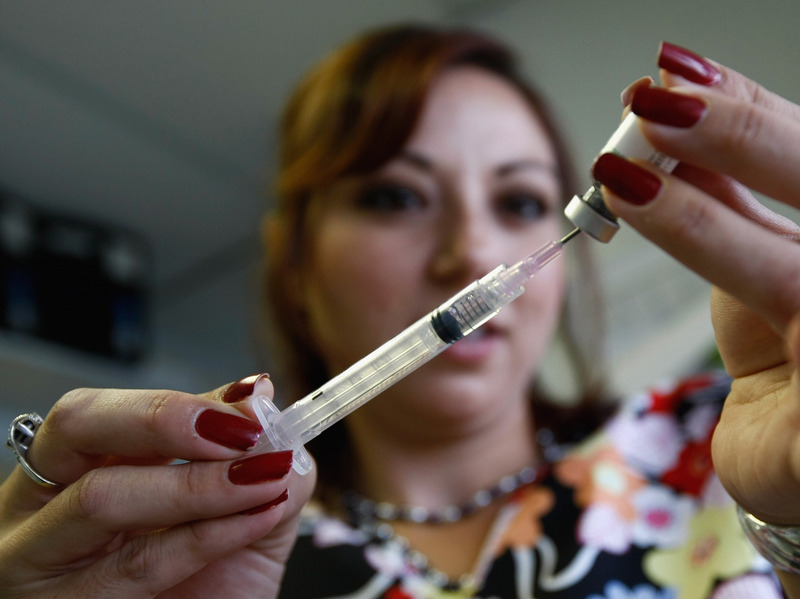 One scientist explains why this "vaccine failure" occurs. 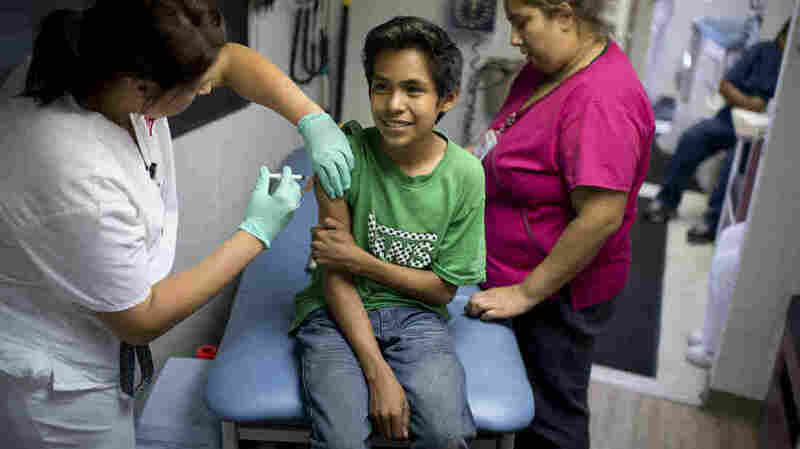 Julio Valenzuela, 11, smiles as he's vaccinated against measles, mumps and rubella at a free clinic in Lynwood, Calif., last August. So far, most of those infected are students or workers at Ohio State, Brown says. And here's what's surprising: Many of those who got sick had previously been immunized against mumps via one of the top weapons against childhood diseases: the MMR vaccine. That's a two-dose shot most of us got when we were kids to protect against three diseases — measles, mumps and rubella. Interestingly, a young woman in New York caught the measles in 2011 even though she, too, had been vaccinated, scientists reported last week. "Measles Mary," as Science magazine called her, also spread the virus to four others. What's going on here? Is one of our best shields against infectious illness faltering? To answer those questions, we talked with a vaccine specialist, Dr. William Schaffner at Vanderbilt University in Nashville. The conversation has been edited for length and clarity. Potent but not perfect: Medical assistant Elissa Ortivez prepares a measles, mumps and rubella vaccine at a clinic in Walsenburg, Colo.
Why can you still get the mumps and measles even if you're vaccinated? Measles is a terrific vaccine. If you get two doses, it's predicted to protect 99.99 percent of people for life. That case in New York was so unusual that it's come to everyone's attention. On rare occasions, the virus trumps an individual's protection. The mumps vaccine, on the other hand, is not so good. The protection rate varies from study to study. But it's usually in the mid-80s. Both vaccines, for mumps and measles, are tamed versions of the viruses. The viruses aren't killed but what we call attenuated, live viruses. If you don't attenuate the mumps virus enough, you get better protection but more complications with the vaccine. So we're walking a fine line. To avoid complications, the mumps vaccine doesn't protect as well as the measles. We wish we had a better mumps vaccine. So the outbreak at Ohio State University is due to "vaccine failure," not declining immunization rates in the U.S.? Yes. In the U.S., we have done a stupendous job of comprehensively vaccinating children. We have the best vaccination record in the world — I'm proud to stay, sitting up with a big smile on my face. But every developed country hasn't gotten with the program. So we have mumps cases imported into the U.S. from Europe and the U.K.
Well, hello — if the British vaccinated everyone, there would be less importation and fewer outbreaks in the U.S.
With the situation in Ohio, what we'll probably find is that the vaccine protected about 85 percent of the people. So you can see that some people who were vaccinated can acquire the illness — if they're exposed. With measles and rubella, protection rates of the vaccine are up in the mid- 90s. What drives these outbreaks in the U.S. are children that have been withheld from vaccines. So it's failure to vaccinate, not vaccine failure — as with mumps. Are you saying that vaccines don't work as well when large groups of people aren't immunized? Correct. Vaccines have two functions: Protect the person vaccinated and provide protection to the entire community. If children are left unvaccinated, measles will find them and make them sick. It's one of the most contagious diseases we have. Mumps is not quite as communicable. But with only about 85 percent of a population protected by the vaccine, outbreaks can smolder along and infect just enough people to keep going. To protect yourself, the No. 1 priority is to make sure everyone is vaccinated. If you know of someone who has the mumps, avoid them. Should adults get a booster of the MMR to protect against mumps outbreaks? We recommend everyone gets two doses of the MMR vaccine. Then, if there is a mumps outbreak in your community, like in Ohio, health workers will figure out which population is at risk and give them a third dose.